Gregg Russell's "Come Away Home Movie"
"Come Away Home,"This family friendly film tells the story of a twelve year old New York City girl, Jordan-Claire Green (The School of Rock) whose summer is interrupted when her parents Lea Thompson (Back to the Future) and Thomas Gibson (Dharma & Greg) decide to leave her with her Grandpa, Paul Dooley (Runaway Bride, Sixteen Candles) for the summer. Filmed almost exclusively on location at Hilton Head Island during the spring and summer of 2004. Over time, these two very different people from contrasting worlds discover the thread that connects them from heart to heart. Popular Hilton Head family entertainer, Gregg Russell, makes his big screen debut as a heart broken performer who, having lost his own family in a tragic accident, befriends this young girl and finds the healing power of love through their friendship. Doug McKeon, best remembered as the teenager in On Golden Pond, directs the film; Mr. McKeon captures the beauty and ambiance of Hilton Head in a spectacular way while exacting stellar performances by Martin Mull (Mr. Mom, Roseanne), David Keith (An Officer and a Gentleman, Lords of Discipline), and Sonya Eddy (Coach Carter, Barbershop). Here's the book that started it all -- the original "Come Away Home" book. 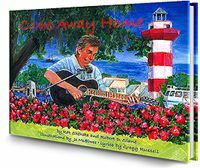 Beloved by all who have visited the harbour at Hilton Head, the "Come Away Home" book!